If you are a martini drinker, you may have noticed other bar patrons ordering theirs "dirty" and wondered "Why is it called a dirty martini?" While it may not sound appealing, a dirty martini is actually a flavorful variation on the traditional cocktail. So, Why Is It Called a Dirty Martini? There are many variations on the martini including the Cosmopolitan or Appletini in which fruit juices or liqueurs replace vermouth for a different flavor. 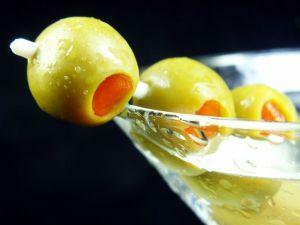 The dirty martini follows the same strategy by using olive brine in vermouth's place or along with it. Either a gin or vodka martini can be made dirty, and it is important that the olive brine is added before the cocktail is shaken or stirred, and not after it is poured into the glass. Extra olives are used as garnishes to emphasize the flavor. The resulting cocktail is much cloudier than a traditional martini. Martini purists may balk at the idea, but if you are a fan of green olives, you may have found your new favorite drink. Otherwise, the concoction might not sound as appealing. When making your own dirty martini, begin by mixing in a small amount of brine and sampling the cocktail to make sure you don't go overboard. Most bartenders are familiar with the trend, although you can ask them to go light or heavy on the olive juice depending on your preferences. Franklin Roosevelt is credited with popularizing this cocktail. Supposedly, during World War II, he met with Joseph Stalin and Winston Churchill and served them dirty martinis. A dirty martini is garnished similarly to a traditional martini, but since the focus is on the olives, some recipes call for gourmet versions such as blue cheese, garlic or jalapeno stuffed olives. While the tastiest tactic is to use fresh olive brine, you may end up with many jars of dry olives if you make this cocktail very often at home. 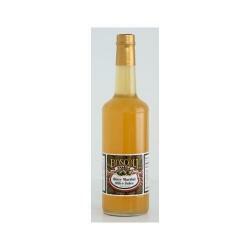 One option is to purchase a large jar of gourmet olives and mix dry vermouth with the juice to make it last longer. However, many manufacturers sell pre-made dirty martini mix. Use gin instead of vodka. The subtle flavor of vodka is no match for the strong flavor of olive brine, while gin's herbal overtones provide a better balance. Determine whether you prefer your dirty martini "slightly dirty" or "filthy". Start with half an ounce of brine to three ounces of gin or vodka, and proceed with caution. Skip the vermouth. The sourness of vermouth can be an odd mix with olive brine. Also, some brines already contain vermouth, so adding more would be overkill. Shake, don't stir. By shaking the liquor with the brine, you ensure that the two blend well and that you serve it extra cold. Don't skimp on the olives. Spend the extra money to get high quality, gourmet olives, and don't use them after they've been sitting in your fridge for too long. Next time you're out on the town or you host a party, try serving dirty martinis. If your friends balk at this seemingly lewd suggestion, now you can explain the answer to "Why is it called a dirty martini?"